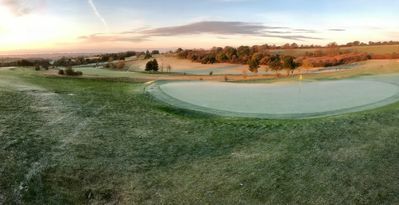 Whether you’re currently an Academy Member or thinking about learning to play, we have superb practice facilities which shelter us from all but the very worst that Mother Nature can throw at us, and your tutor will demonstrate exercises that you can also do at home, so that you look like ‘poetry in motion’ when sunnier climes arrive. So, come on everyone, join us for group classes, take private tuition, use the par 3 course, practice on the range and exercise at home. It couldn’t be easier! This is also the time of year to ensure your golfing equipment is ready and adequate for the playing season ahead. Check your grips: we notice, when teaching, so many pupils grips are either worn or shiny. The rubber grip is the only contact we have with the club and as the club can travel up to 100 miles an hour we better be able to hold onto to it. If you need new grips they start at just £5 each, fitted (hardly a King’s ransom). Also, check your studs. You should have metal spikes at this time with the slopes being potentially slippery. Many accidents derive from golfers losing their footing. "The harder I practice the luckier I get." "Golf is a puzzle without an answer. I’ve played the game for 40 years and I still haven’t the slightest idea how to play." Oh dear, some hope for us!